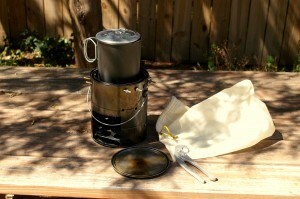 A couple of years ago I read Paul Van Horn’s online article on his Nomad stove. I like Paul Van Horn. I first discovered his writing while developing a school curriculum that focused on human reliance on natural resources for grad school. The project led to my current interest (obsession??) in traditional woodcraft skills. Improved Nomad Stove. 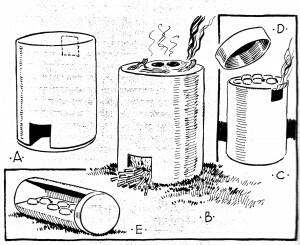 Note side opening for loading firewood, fresh air vents at the bottom of the can, cooking grate from removable brass rod and lower set of holes to adjust the grate for windy conditions. 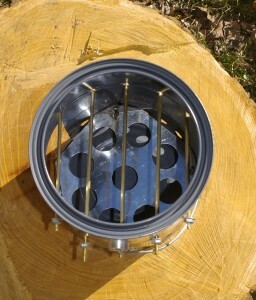 Looking into the mouth of the Improved Nomad Stove. The ventilated raised floor can be seen underneath the pot supports. 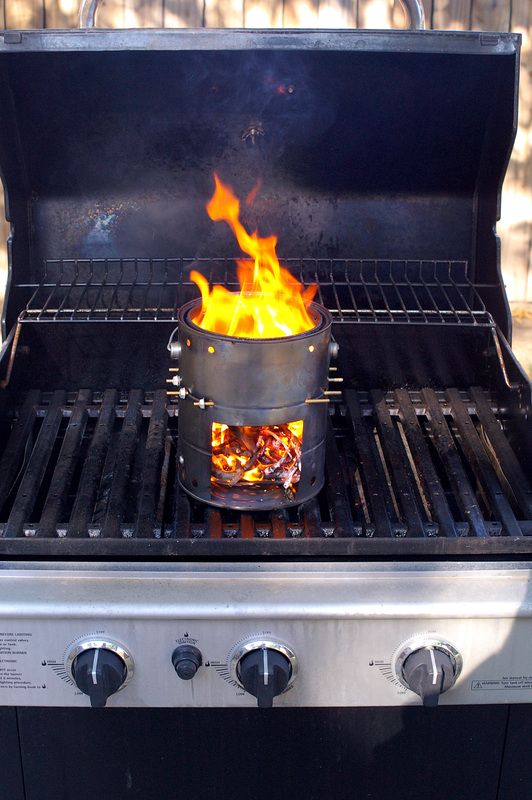 According to Paul Van Horn, “the pot must be of a size that allows it to sit down inside the stove with a minimum of ¾” clearance between the sides and the wall of the stove on all sides. A pot that is too large will result in a smoky, sooty burn.” I just could not find the right pot. 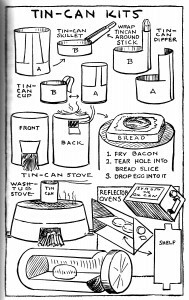 Van Horn used a tin can but reading Camp Craft by Warren H. Miller (1918), one of my very favorite authors, proved that very well made aluminum camp cookware was available around the turn of the century. Desiring a light aluminum cook pot of the right size, I searched for over a year until I found this 5-cup Bush Pot at Ben’s Backwoods. 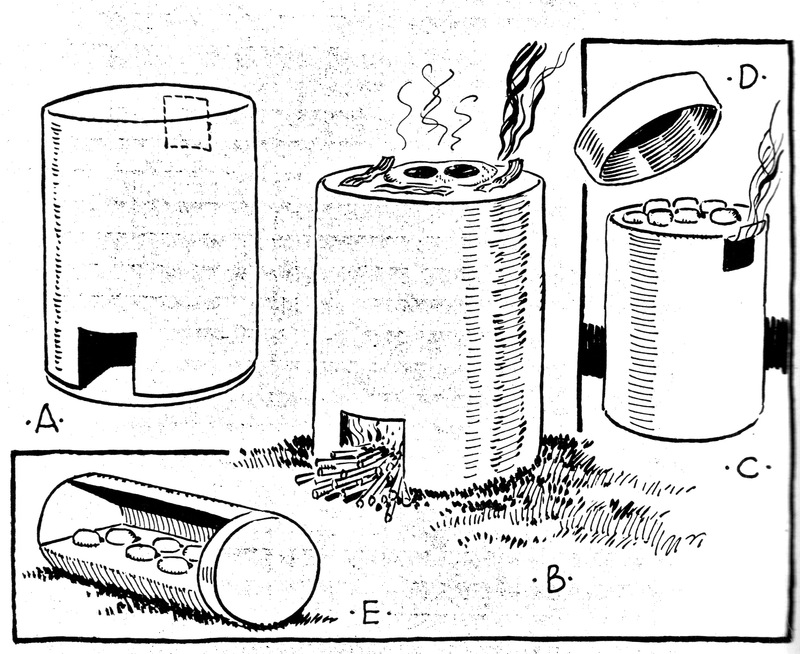 It is a smaller version of the Mors Kochanski Bush Pot. The new pot fit perfectly! Made from dark anodized aluminum, it’s fitted with a very snug lid with a lift handle and like the Kochanski pot features a pour spout and folding handles. The pot comes with a bail kit that the owner may attach if they so desire Sadly, the pot will not fit into the paint can with the bail attached. 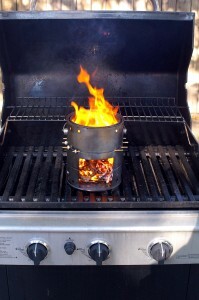 To ready the stove for use, I ignited a fire in it to burn the paint off the inside of the can and underside of the lid. WOW! Does this stove burn hot! One thing I quickly learned was to have a large pile of twigs handy because the stove will consume them rapidly. After removing the paint, I rubbed the interior and exterior of the can with vegetable oil and heated it over a very low flame on on my range, “seasoning” it as you would a dutch oven to produce a protective rustproof coating. Then I sewed up a storage sack from pre-shrunk cotton muslin that I coated with Filson Oil Finish Wax. 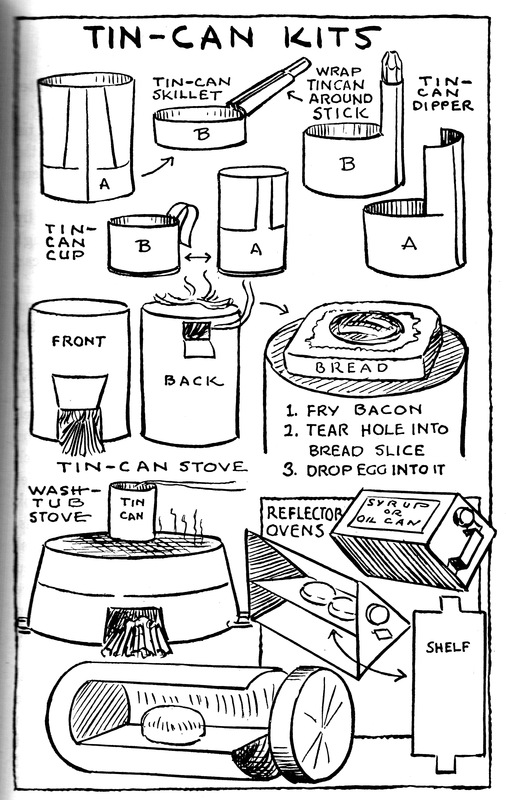 I pack the stove away by sliding the brass rods into spaces between the inside of the can and the interior floor. 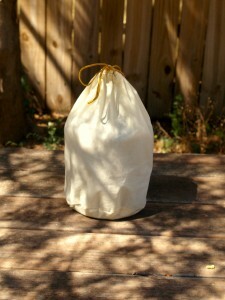 Then, in goes the bush pot, wrapped in a flour-sack dish towel. with a pair of deerskin gloves packed inside. The pot lifter fits down between pot and stove can and the lid is pressed on. Finally, the stove is placed into the stuff sack and is ready for the trail! I like this stove alot. 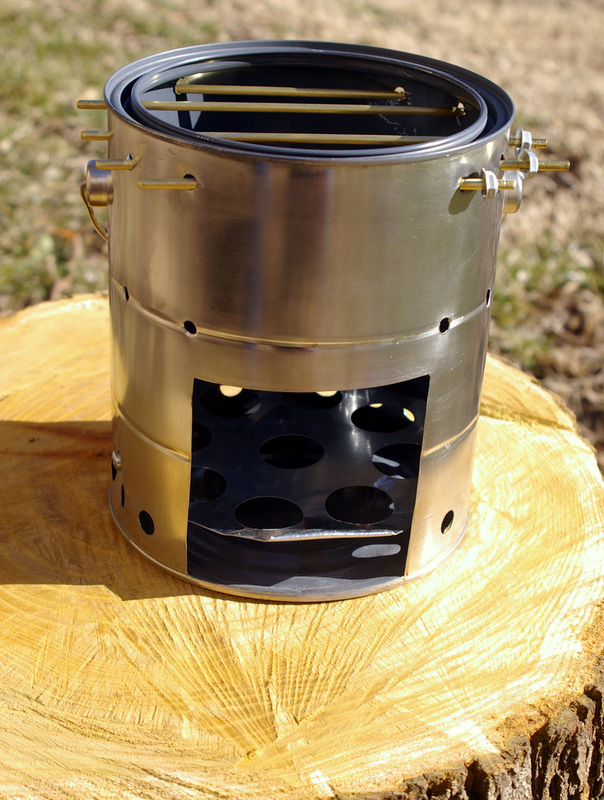 It was easy to make, performs very well and is a versatile cooker – producing boiling water to pancakes and fried eggs. I’ve been very pleased with how it turned out and now share it with the fraternity of outers that enjoy spending time under the stars.